The Bathroom. It may be one of the smaller rooms in our home, but that doesn’t mean it’s less important than the others. The feel of the room where we bathe and freshen up each morning has the potential to influence our mood for the rest of the day! Fortunately, if you are planning on renovating your bathroom, the opportunities are wide open! No matter how big or small your space is, there are fixtures and materials available to make it just right. In our first bathroom, Heather Garrett Design makes great use of natural materials like wood and stone along with classic elements like tile for a simple and timeless feel. Everything is positioned with the window in mind, so that you can enjoy natural sunlight no matter where in the bathroom you are. The wall between the sinks and the toilet offers just enough privacy without being overbearing or blocking out the natural light. Jordan Furniture’s use of sleek modern design helps this washroom feel spacious, despite its small and narrow floor space. Storage embedded in the wall keeps everything neat and tidy. 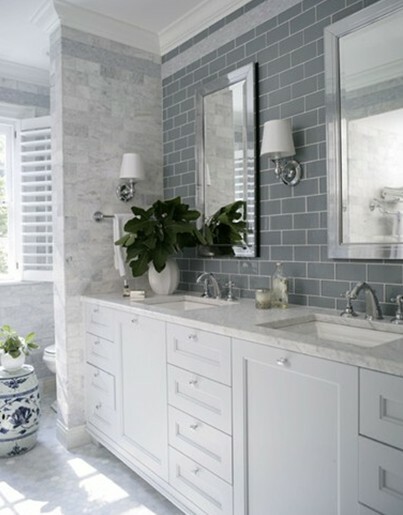 Clean lines and the contrast between dark greys and bright whites add an air of quiet sophistication. This bathroom from Design Excellence is a great example of how to make the best of a small space. Each element is carefully placed in order to maximize usable space, and the clear glass partitions for the shower keep the room from feeling any smaller than it needs to. The cream and pink colors are the perfect balance between lightness and warmth, so the room feels bright, open and cozy at the same time. When designing the layout of your washroom, it is important to pay attention to what lies outside your walls as well as what is within. Case in point: the stunning view of the lovely tree and landscape from this washroom from Griffin Enright Architects. The dark wood elements add a touch of warmth and stability, while the white fixtures provide balancing contrast. And of course, everything is situated to bask in the light and the view of the windows. Friedman and Shields takes advantage of the extra floor space in this bathroom to get creative. Check out the lovely bathtub set at an angle next to the large window! Still, the light from the window is not blocked from filling the rest of the room, and access to the separate spacious shower is unobstructed. The palate plays with contrast, while still keeping everything grounded in welcoming earth tones.